General Description: Welcome to Pashos in Kryopigi. The hotel is located 300 m from the gravel and sandy beach. The closest city to the hotel is Kallithea (3 km). Other cities: Nea Moudania (33 km), Thessaloniki (95 km). To make your stay more comfortable air conditioning, a reception, a lobby and a General Description: Welcome to Pashos in Kryopigi. The hotel is located 300 m from the gravel and sandy beach. 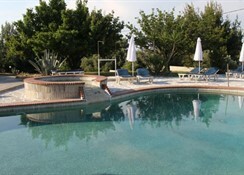 The closest city to the hotel is Kallithea (3 km). Other cities: Nea Moudania (33 km), Thessaloniki (95 km). To make your stay more comfortable air conditioning, a reception, a lobby and a lounge are available. The staff in this 2 storey hotel speaks German and English. 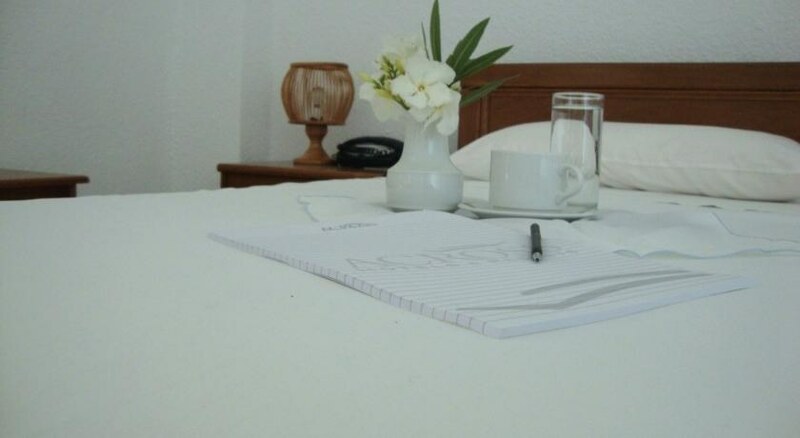 For guests who wish to be mobile, bicycle rental, motorbike rental and car rental can be arranged. A playground for children is available. 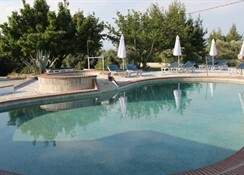 The hotel features a fresh water swimming pool, seasonally open with a separate children s pool. A poolside bar is on site at the hotel where guests can unwind with a drink. Sunshades and sunbeds are available for an additional fee at the beach. The hotel is within easy reach of bus stops. Distance from the hotel to: supermarkets (3 km), airport SKG (85) and disco (3 km). For your entertainment the hotel features a TV lounge. Vehicles may be parked in the parking lot. Honeymooners are welcome at Pashos where they can enjoy the dining and great room views. Amenities: For convenience the hotel offers maid service, laundry service, room service, a safe, wake-up service, babysitting, currency exchange, medical care, ironing service and secure entry system. Internet access is provided at internet terminals. This family friendly hotel offers a children s pool and babysitting service to ensure a comfortable stay for parents as well as young guests. Reception hours: 06:00 - 01:00. Meals: The breakfast type is Buffet and it is provided from 07:30 - 10:00. Guests are welcome to enjoy their meals at the restaurant. Sport and Leisure: A variety of activities are provided by the hotel such as table tennis. Guests who wish to be active on holiday can enjoy activities such as exercise in the fitness room. Additional Information: The following payments are accepted: Euro/Master Card and Visa Card. Additional fees may apply for certain facilities, amenities or activities.